This macaron inspired cocktail was also inspired by my one of my favorite people on Earth: Miranda (a.k.a The Macaron Fairy). She was sweet enough to send me a box of macarons from Bottega Louie, an amazing restaurant in Los Angeles. She got me an assortment: rose, pistachio, salted caramel and two mystery macarons. The mystery macarons were the purple and brown ones. The purple one was Violet Cassis; with violet infused buttercream & a cassis compote with white chocolate ganache. The brown one was Praline; with praline buttercream & fresh Valencia orange zest. I needed to create a cocktail inspired by the macarons. Step one was knowing my friend well enough to know she wanted a vodka based cocktail. Step two was making my salted caramel syrup, as a tribute to the salted caramel macaron that was beyond addictive, and using it as the sweetener since I know my friend well enough to know she likes her cocktails sweet, just like her ;) . Did I mention I know my friend well? Ok, good, because I do. Step three was realizing I needed to use cassis (a liqueur made from black currants), the flavor of the Violet Cassis macaron. Step four was deciding to use fresh Valencia orange juice since the Praline macaron had Valencia orange zest in it. Start by tossing some ice into a cocktail shaker and add as much vodka as you think you need for one cocktail (I used 1 oz). 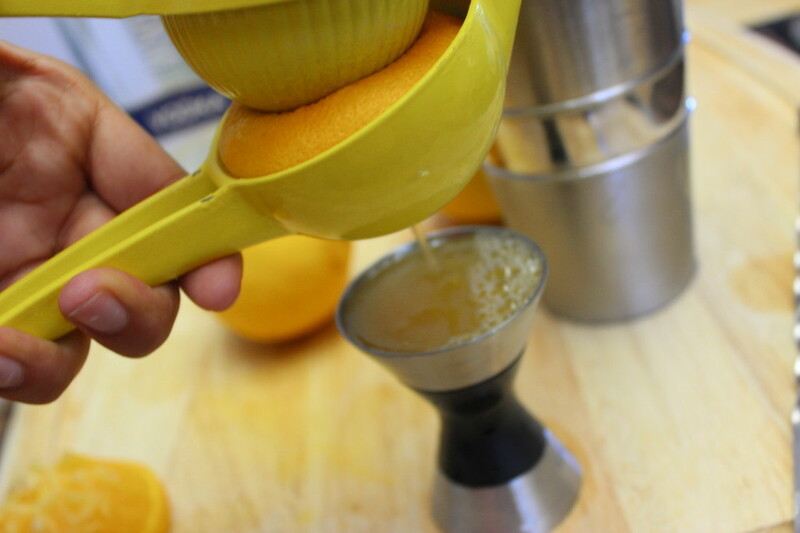 If you like your drinks super sweet, add just 3 oz of fresh squeezed orange juice. I added 4 oz and I thought it was still sweet. If you aren't sure, taste after adding 3 oz of the OJ and add more if it's too sweet. Add a thin slice of orange into a glass for garnish (or a macaron on the rim if you have enough self control to save a macaron for garnish, I don't), shake the cocktail and pour it into the glass. I'd like to give thanks to Miranda, The Macaron Fairy. Place ice into a cocktail shaker, add all the ingredients and shake.